Taking a screenshot is the easiest and quickest way to make a copy of something that you want for later reference. But did you know that you can also take screenshots of specific areas of the screen without having to crop them later? On apps such as Instagram, it’s not easy to download images so taking screenshot can be extremely handy. When using Windows, taking screenshots is easier than you can imagine and can be done in any version of Windows. So, let’s discuss the simplest and easiest ways to take screenshots in Windows 10,8,7, Vista and XP. Step 1: Click on the ‘Start’ button. Step 2: Click on the ‘Snipping Tool’ or click start menu or choose All Programs, then Accessories And select the Snipping Tool from the list. Step 3: When you see ‘Snipping Tool’ window, start dragging the cursor on the area which you want to capture. Step 4: Once you will release the cursor it will automatically capture the screenshot. Step 5: Now, save the image. Hitting the PrtScn button will copy an image of your entire screen. This can be done in three different ways. Open the window for which you would like to take a screenshot and press the print screen button from your keyboard. Now, paste the image in Paint app by pressing CTRL+V or clicking on the paste button. Here you can make changes to the image if required and don’t forget to save the changes. This is another easiest method to capture your screen. All you have to do is, simultaneously press Alt + PrtScn, open Paint and paste the image. Once you see the same image on paint screen, click on save icon on the top left-hand side of the paint window. Note: You will see print screen button is in the upper right-hand side corner of your keyboard (Next to Scroll Lock). Press Win + PrtScn at the same time to take a screenshot in Windows 8 and later versions and then you can save the picture in the default Pictures folder in a subfolder called Screenshots. Instead of Paint, you can also use Microsoft Word and Photoshop to paste and save the images. However, Paint is most commonly used to save the images. 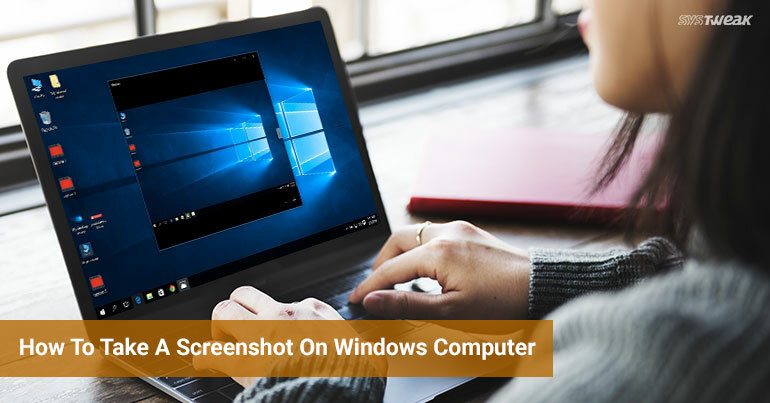 These are the few ways to take a screenshot in a jiffy but as Windows only provide basic screenshot facility, you can download any third-party software to enjoy the advanced functions such as editing, adding frames, pixels, etc.